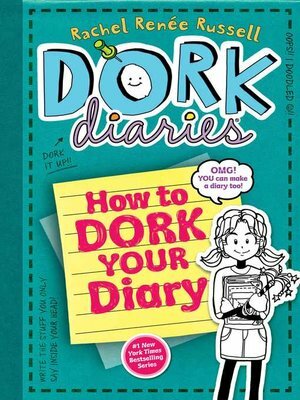 Create your own Dork Diary with this special, interactive addition to the New York Times bestselling Dork Diaries series. Nikki Maxwell has been writing in a diary since the start of the school year, and she usually takes it everywhere she goes—so she can't believe it when one morning she can't find her diary! The hunt is on, and while she looks, pursuing various theories about where it could be, Nikki can't help putting together a list of important diary-keeping lessons to remember in case of missing diary emergencies like this one. How to Dork Your Diary is chock full of tips from Nikki on fun things to write about in your diary, with lots of space for readers to write and draw their own entries. Meanwhile Nikki's friends Chloe and Zoey, her little sister Brianna, her crush Brandon, and mean girl MacKenzie are all a part of the story as Nikki searches everywhere for that diary, with plenty of adventures along the way! Rachel Renée Russell is an attorney who prefers writing tween books to legal briefs. (Mainly because books are a lot more fun and pajamas and bunny slippers arent allowed in court.) Rachel lives in Chantilly, Virginia.